It is with sadness we at UMB received the message that Nelson Mandela died December 5th, 2013. 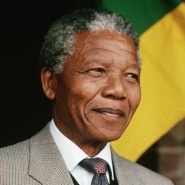 Mandela was the great freedom-fighter of South-Africa, he led ANC in the fight against the apartheid-system, sat 27 years in prison on Robben Island and was in 1994 elected as South-Africas first coloured president. Every day, since he in 1990 got his freedom, Mandela communicated his deep belief in reconciliation, human dignity and optimism. He did this with extraordinary strength and passion. Mandela was in many ways a leader for all Africans and showed the world that great changes is possible. Today, UMB has raised its flag at half mast. With this we will show our respect and gratitude to the great leader of our time, Nelson Mandela.